^ 3.0 3.1 Ukraine PM to stand for president. BBC News. 2009-06-07. ^ 13.0 13.1 （乌克兰文） Prime Minister Yulia Tymoshenko. Unofficial Biography. 烏克蘭真理報. 2005-02-04. ^ UKRAINIAN PARLIAMENT FORMED ITS PERMANENT COMMITTEES. 烏克蘭駐美國大使館（烏克蘭語：Посольство України в США）. 1998-07-21. ^ “It is possible to establish order in this country in two or three years”. 季莫申科官方網站. 2001-10-25. （原始内容存档于2007-05-27）. ^ （乌克兰文） Історія партійної організації. 官方網站. ^ Russia Drops Charges Against Ukrainian. 紐約時報. 2005-09-27. ^ 25.0 25.1 Russian prosecutors cancel arrest warrant for Tymoshenko. UA-Reporter. 2005-09-27. ^ Ukraine opposition leader injured. BBC News. January 29, 2002 [2007-10-05]. ^ Ukraine coalition born in chaos. BBC News. 2006-07-11. ^ Veronica Khokhlova. New Kids On the Bloc. 紐約時報. 2004-11-26. ^ Ukraine's 'goddess of revolution'. BBC News. 2004-12-02. ^ Profile: Viktor Yushchenko. BBC News. 2008-10-09. ^ The 100 Most Powerful Women. 富比世雜誌. 2006-08-31. ^ Zinchenko's bombshell. 基輔郵報. 2005-09-07. ^ Oleksandr Zinchenko talks. 基輔郵報. 2005-12-21. ^ Orange Revolution in turmoil. BBC News. 2005-09-08. ^ 38.0 38.1 Ukraine leader sacks government. BBC News. 2005-09-28. ^ Ukraine: A Post-Orange Revolution Political Timeline. Radio Free Europe/Radio Liberty. 2006-03-21. ^ 43.0 43.1 Ukraine leaders jostle for power. BBC News. 2006-03-27. ^ Timeline: Ukraine. BBC News. ^ Ukraine allies 'agree coalition'. BBC News. 2006-06-21. ^ Ukraine coalition deal confirmed. BBC News. 2006-06-22. ^ 47.0 47.1 47.2 （乌克兰文） Парламент почав працювати, але коаліції в ньому більше немає. День. 2006-07-07. ^ Oleksandr Moroz announced a new coalition for Ukraine. 歐洲民主與團結論壇. 2006-07-11. （原始内容存档于2011-07-25）. ^ 50.0 50.1 Opposition Blocks Ukrainian Parliament Session. Radio Free Europe/Radio Liberty. 2006-06-27. ^ Ukrainian coalition, opposition to hold round table aimed to solve political crisis. 基輔郵報. 2006-07-03. ^ Sit-in disrupts Ukraine assembly. BBC News. 2006-06-29 [2006-08-26]. ^ ELECTION OF NEW PRIME MINISTER AND GOVERNMENT (PDF). European Country of Origin Information Network. 2006-05. ^ Lawmakers loyal to Yushchenko call for new elections in Ukraine after pro-Russian parties announce coalition. 基輔郵報. 2006-07-11. ^ Ukraine's Orange coalition falls apart after Socialists break ranks. 基輔郵報. 2006-07-07. ^ Ukraine’s political fate shifts amid Rada chaos. 基輔郵報. 2006-07-13. ^ Ukraine's Leftists Announce New Coalition. Radio Free Europe/Radio Liberty. 2006-07-07. ^ Ukraine: Two Viktors, But No Clear Winner. Radio Free Europe/Radio Liberty. [2006-10-06]. ^ Ukrainian rivals rally in capital. BBC News. 2007-04-01. ^ Y. TYMOSHENKO, "Containing Russia 互联网档案馆的存檔，存档日期2007-05-17." 外交, May–June 2007, pp. 69–83. ^ I. KHRESTIN, "The Kremlin’s Issue with Foreign Affairs" in 旗幟周刊, April 17, 2007. ^ Russian Embassy to South Africa, Russian MFA Information and Press Department Commentary Regarding a Question from RIA Novosti Concerning Yulia Tymoshenko’s Article ‘Containing Russia’ in the Journal Foreign Afffairs. 互联网档案馆的存檔，存档日期2008-12-31. ^ The Article by Russian Minister of Foreign Affairs Sergey Lavrov "Containing Russia: Back to the Future?" ^ Orange bloc edges to poll victory. BBC News. 2007-10-03 [2006-08-26]. ^ Ukrainian Parliament Continues Shift Towards Yushchenko. Korrespondent. 2007-10-15 [2007-10-15] （俄语）. ^ Parliament named Tymoshenko as the Prime Minister of Ukraine. Korrespondent. 2007-12-18 [2007-12-18] （俄语）. ^ Youtube. Youtube: Yulia Tymoshenko elected Prime-Minister. 2007-12-18 [2007-12-18] （乌克兰语）. ^ Ukraine PM accused of 'high treason' over Georgia. EurActiv. 2008-08-20 [2008-09-10]. （原始内容存档于2008-09-20）. ^ Newsletter for the international community providing views and analysis from the Bloc of Yulia Tymoshenko (BYuT) (PDF). 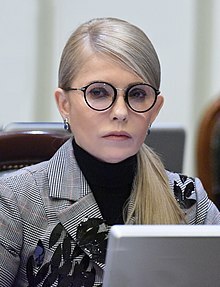 Bloc Yulia Tymoshenko. 2008-09-08 [2008-09-08]. （原始内容 (PDF)存档于2008-10-29）. ^ Baloha: Tymoshenko not Orthodox, she practices another faith. 烏克蘭獨立新聞社. 2008-07-29 [2008-07-29]. ^ Baloha: Tymoshenko promised Putin not to support Ukraine's joining NATO MAP. 烏克蘭獨立新聞社. 2008-07-16 [2008-07-16]. ^ Baloha accuses Tymoshenko of deliberate destroying coalition烏克蘭獨立新聞社. 2008-04-10 [2008-04-10]. ^ Baloha calls on to sack Ministers from government’s economic bloc. 烏克蘭獨立新聞社. 2008-04-15 [2008-04-15]. ^ Tymoshenko "calms down" Baloha saying his chief must not be concerned. 烏克蘭獨立新聞社. 2008-09-01 [2008-09-10]. ^ Why Ukraine's Pro-Western Coalition Split. 時代雜誌. 2008-09-04 [2008-09-10]. ^ Yushchenko May Dissolve Ukraine Parliament, Call Vote. 彭博社. 2008-09-03 [2008-09-10]. ^ Ukraine gets third election in three years. 荷蘭國際電台. 2008-10-08 [2008-10-08]. （原始内容存档于2009-03-08）. ^ Snap election called in Ukraine. BBC News. 2008-10-08 [2008-10-08]. ^ Tymoshenko to propose creating “megacoalition” during NSDC meeting. Personal web site of Yulia Tymoshenko. 2008-10-20. （原始内容存档于2008-12-31）. ^ Ukraine calls early election. 路透社. 2008-10-08. ^ Ukraine president calls election for December. 愛爾蘭時報. 2008-10-09 [2008-10-09]. ^ Ukraine election date is uncertain, says president. 烏克蘭獨立新聞社. 2008-10-22. ^ Finance crises delay Ukraine vote. BBC News. 2008-10-20. ^ Ukraine's president says no election this year. 烏克蘭獨立新聞社. 2008-11-12. ^ Tymoshenko Not Intending To Resign. 烏克蘭通訊社. 2008-10-10. （原始内容存档于2009-01-22）. ^ Tymoshenko won’t resign until a new coalition is formed. 烏克蘭獨立新聞社. 2008-10-10. ^ Experts Admit Party Of Regions-Tymoshenko Bloc Coalition If Pliusch Nominated For Speaker’s Position. 烏克蘭通訊社. 2008-12-03. （原始内容存档于2009-01-08）. ^ Ukraine coalition set to reform. BBC News. 2008-12-09. ^ New parliamentary majority receives name. 烏克蘭獨立新聞社. 2008-11-12. ^ Lavrynovych Speaking About Majority Between BYuT, OU PSD, Lytvyn Bloc And Communist Party Faction At Rada. 烏克蘭通訊社. 2008-12-13. （原始内容存档于2012-12-08）. ^ Tymoshenko Bloc, OU-PSD, And Lytvyn Bloc Sign Rada Coalition Agreement. 烏克蘭通訊社. 2008-12-06. （原始内容存档于2009-01-22）. ^ Lytvyn Predicts Rada’s Work Until 2012. 烏克蘭通訊社. 2008-12-13. （原始内容存档于2009-01-23）. ^ President calls on VR to focus on overcoming economic crisis. 烏克蘭獨立新聞社. 2008-12-11. ^ Yushchenko categorically opposed to “coalition of three” – Hrytsenko. 烏克蘭獨立新聞社. 2008-12-15. ^ Presidential Secretariat urges parliament to include early election funds in 2009 budget. 烏克蘭國際文傳電訊社. 2008-12-15. ^ Rada Denies Support To No Confidence In Cabinet. 烏克蘭通訊社. 2009-02-05. （原始内容存档于2012-03-30）. ^ Ukrainian parliament rejects no-confidence vote in government. 烏克蘭國際文傳電訊社. 2009-02-05. ^ Tymoshenko accuses Yuschenko of obstructing executive authorities' teamwork. 烏克蘭國際文傳電訊社. 2009-02-06. ^ Yuschenko demands immediate amendments to 2009 budget to save Ukraine's economy – televised address to nation. 烏克蘭國際文傳電訊社. 2009-01-30. ^ Yushchenko, Tymoshenko criticize each other (photo-report). 烏克蘭國際文傳電訊社. 2009-02-11. ^ Agreement with Russia threatens Ukraine’s security - President. 烏克蘭國際文傳電訊社. 2009-02-10. ^ Presidential secretariat considers PM's report "theatrical performance". 烏克蘭國際文傳電訊社. 2009-02-05. ^ Premier says Regions Party wanted to destabilize government work. 烏克蘭國際文傳電訊社. 2009-02-05. ^ Tymoshenko: Political Competition Accounts For Conflict With Yuschenko. 烏克蘭通訊社. 2009-02-11. （原始内容存档于2012-03-15）. ^ Feifer, Gregory. Ukraine's Tymoshenko Likely Prime Minister. National Public Radio. 2007-10-02 [2007-10-05]. ^ 110.0 110.1 110.2 Yulia Tymoshenko Won't Be President. Kommersant. 2008-04-17. （原始内容存档于2008-11-20）. ^ Tymoshenko not to challenge election results if defeated. 烏克蘭國際文傳電訊社. 2009-09-24. ^ Tymoshenko promised not to dispute results of election of President. 烏克蘭國際文傳電訊社. 2009-09-24. ^ 參加藝人有魯斯蘭娜、亞歷山大·波諾馬廖夫（英语：Oleksandr Ponomaryov）、阿尼·洛拉克（英语：Ani Lorak）、波塔普（英语：Potap）與娜斯佳·卡緬斯基赫（英语：Nastia Kamenskikh）、蒂娜·卡羅爾（英语：Tina Karol）、Natalia Mogilevska、伊琳娜·比雷克（英语：Iryna Bilyk）、TIK（英语：TIK (band)）、TNMK（英语：TNMK）、“Druha Rika”、Mad Heads XL（英语：Mad Heads XL）。參見這裡 互联网档案馆的存檔，存档日期2009-09-22. ^ Events by themes: Allukrainian round ”With Ukraine in a heart!”. 烏克蘭國際文傳電訊社. ^ Mogilevska went to Tymoshenko. 烏克蘭國際文傳電訊社. 2008-09-11. ^ Tymoshenko enters presidential race. 2009-10-25. （原始内容存档于2010-11-28）. ^ （乌克兰文） Тимошенко розповіла, як розвантажувала шини, а Скрипка за неї співав. Табло ID. 2009-10-26. ^ Christian-Democratic Union party to support Tymoshenko at presidential election. 基輔郵報. 2009-10-28. ^ European Party gives its support to Tymoshenko in presidential race. 烏克蘭國際文傳電訊社. 2009-12-04. ^ Interior Minister takes short leave, urges voters to support Tymoshenko. 基輔郵報. 2009-12-11. ^ Russia's Putin says not backing Ukraine's Tymoshenko. 路透社. 2009-12-03. ^ About football and luck. 季莫申科官方個人網誌. 2009-12-07. ^ Paid advisers descend on candidates, nation. 基輔郵報. 2009-11-19. ^ Tymoshenko: Early parliamentary elections may follow presidential ballot in Ukraine. 基輔郵報. 2009-11-26. ^ Tymoshenko urges national democratic forces to unite around candidate in second round. 烏克蘭國際文傳電訊社. 2009-12-01. ^ Tymoshenko to go into opposition if not elected president. 基輔郵報. 2009-12-05. ^ Former Ukraine PM is jailed in US. BBC News. 2006-08-25 [2006-08-26]. ^ The 100 Most Powerful Women. 富比世. 2008-08-27 [2008-08-27]. ^ The 100 Most Powerful Women - #47 Yulia Tymoshenko. 富比世. 2009-08-20. ^ 169.0 169.1 Westcott, Kathryn. The queen of Ukraine's image machine. BBC News. [2007-10-05]. ^ 183.0 183.1 Billen, Andrew. Crowning glory awaits the Orange heir apparent. 基輔郵報 (倫敦). 2006-05-20 [2007-10-05].